Lagonissi (Greek: Λαγονήσι meaning "rabbit island") is a seaside residential area in the southern part of Kalyvia Thorikou in East Attica. It is situated close to the shore and on a peninsula by the Saronic Gulf. 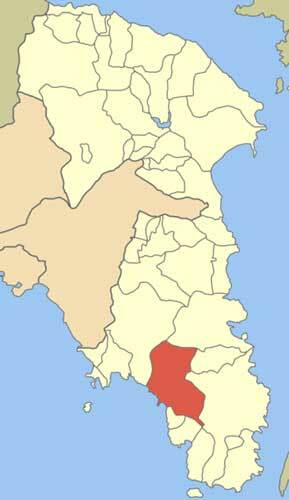 Lagonisi is located approximately 30 km southeast of Athens and 35 km northwest of Cape Sounio. Being filled with luxury homes, beaches as well as a 5-star hotel that lie within the Saronic, it is one of the most expensive areas in Attica Prefecture. Restaurant facilities, cafeterias and bars are located mainly on the heart of Lagonissi, close to Kalyvion Avenue (the road connecting Lagonissi with Kalyvia Thorikou). Lagonissi has many beautiful sandy beaches including those of Pefko, Agios Nikolas and Galazia Akti which are organised. In recent years, the Greek government-debt crisis has led to the privatisation of many state owned properties, including beaches. The state is oriented towards their privatisation, although locals' opposition makes beaches' future property status uncertain. The increasing number of new residents, most notably from the southern suburbs of Athens has led to the construction of public schools for children of all ages. Most specifically, the last decades there have been built 2 nursery schools, 2 primary schools, 1 gymnasium and 1 lyceum. There are also two private nursery schools, one of whom is English-speaking. Greek National Road 91 connects Lagonissi with Athens and Sounio, while new-built Thorikou road connects Lagonissi with Greek National Road 89. OASA (Athens Urban Transport Organisation) operates a frequent all-year round bus service to and from Elliniko metro station with the designation 122. The average travel time between Lagonisi and Elliniko metro station is about 50 minutes. Furthermore, there is a KTEL coach service connecting central Athens with the entire coastal area of western Attica, from Palaio Faliro to Cape Sounion. An inter-municipality bus service operating four to five times per day connects Lagonissi with Kalyvia Thorikou. Taxi service is available as well. Lagonissi has an indoor basketball/volleyball arena located close to the gymnasium. There are numerous outdoor basketball courts and football pitches, a tennis court and two beach volleball courts. Furthermore, there is a gym and many indoor areas provide lessons for martial arts, yoga and aerobic exercises. An equestrian club called "St.George" is located in the eastern outskirts of the community as well.